Glaucoma is defined as increased intraocular pressure. There are many forms of glaucoma: primary, secondary, and traumatic are the most common. What is the difference between the types of Glaucoma? - Primary glaucoma is caused by decreased outflow of aqueous from the anterior chamber due to malfunction of intraocular structures. - Secondary glaucoma occurs in response to another condition within the eye. Intraocular neoplasia, lens luxation, severe uveitis (inflammation) or severe lens induced uveitis (inflammation caused by cataract formation), aqueous misdirection, and pigment dispersion are examples of primary conditions that can result in glaucoma. 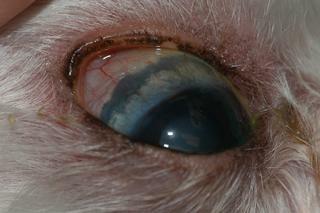 - Severe ocular trauma may result in glaucoma in some cases. 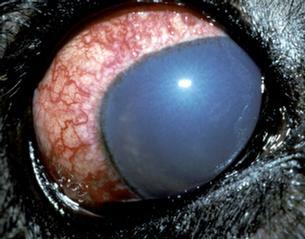 -Aqueous misdirection syndrome is uncommon and occurs in cats. The fluid from the front of the eye (aqueous humor) flows into the back of the eye, which causes shallowing of the anterior chamber and elevated intraocular pressure. Diagnosis is made after measuring the intraocular pressure and confirming changes to intraocular structures. Intraocular pressure is measured by tonometry. Animal Eye Clinic uses a Tonopen� to measure intraocular pressure. Several other instruments are available, such as the TonoVet� and the Schiotz indentation tonometer. Once intraocular pressure has been established, Dr. Paulsen examines the filtration angle of the eye (Gonioscopy), the optic nerve, and the retina. Glaucoma is treated on a patient by patient basis. Glaucoma is a progressive disease and requires lifelong treatment. Some patients are treated with medical therapy, while others require surgical intervention. There are many types of surgical techniques available to treat glaucoma patients. 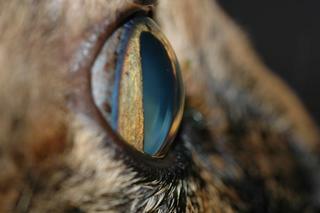 Animal Eye Clinic utilizes Laser Cyclophotocoagulation (CPC).